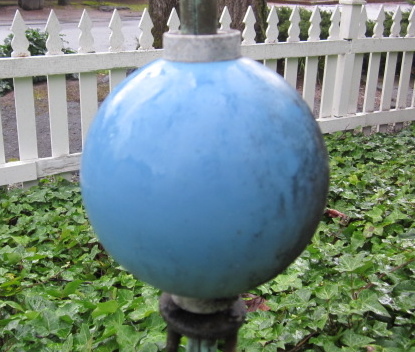 Yesterday, I walked through the picket gate and casually glanced to my left, where something caught my eye—the light blue ceramic ball floating above the ivy bed. When we first moved into this magical house some 20 years ago, we decided to fill it with old things, befitting its centenarian status. On weekends, we scrounged the dusty corners of local antique shops in search of finds. One bright Saturday afternoon we found an old lightning rod, like the ones that used to be perched atop houses and barns. We were flooded with fond memories of our roots in the mid-west—the land of grand thunderstorms and crazy lightning. In western Indiana, we actually used to take our kids out for drives during dramatic storms to watch the light show across the theater of the flat fields. They were fantastic! 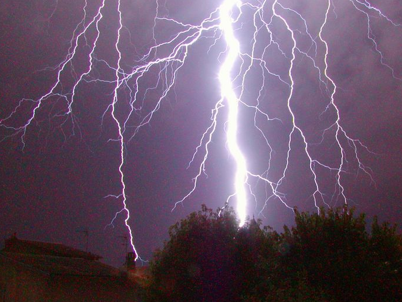 The mere thought of lightning transports me back to one particular story: Uncle Ed’s brush with death. Wow, what a spooky, yet intriguing childhood memory. The story goes something like this: Trying to close the vents at the top of the greenhouse before the storm hit, Uncle Ed reached up with his right hand. What a lucky choice for him, since we were told that if lightning passes through the left side, the heart would certainly stop. Zap!! A bolt of white light flashed through his body, blasting him from his teetering perch, high atop the ladder. He was all right, no permanent damage, but it sure gave the family a tale to embellish and share with wide-eyed listeners like us kids. Lightning ranks right up there with tornadoes, as one of those fascinating mysteries of nature, adding to our rich stash of somewhat unexplainable images—both dangerous and attractive at the same time. 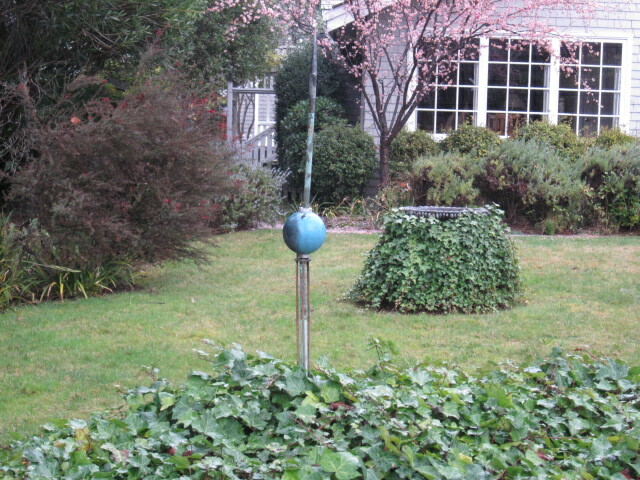 So we decided to place our newly-acquired lightning rod in the front yard ivy bed as a piece of historical art. We considered it sculpture. A neighbor wandered down the sidewalk one day while we were doing yard work. “What’s that?” he asked us. “It’s an antique lightning rod.” He squinted and scratched his head. “Is it attached to something?” We looked at our neighbor with mischievous smiles as Cheryl began the yarn, “It sure is.” Then, we let our imaginations run wild, fabricating a new story: A tornado had blown an old mid-western farmhouse all the way to the west coast, where it finally landed like a meteor making a huge divit in our front lawn. Over the next 100 years, the ground had settled and the ivy began to grow. The only visible reminder is the old lightning rod that still sticks up out of the ivy—the roof only a few feet underground. Should we ever decide to excavate, we would find the entire house three stories down, furnishings and all! Who would ever think that an orphaned spike with a blue ceramic ball found in the corner of an antique shop could conjure up such images and humor? It seems to be a tale straight from the Wizard of Oz, but with a twist. A bit of front yard fantasy to be sure. 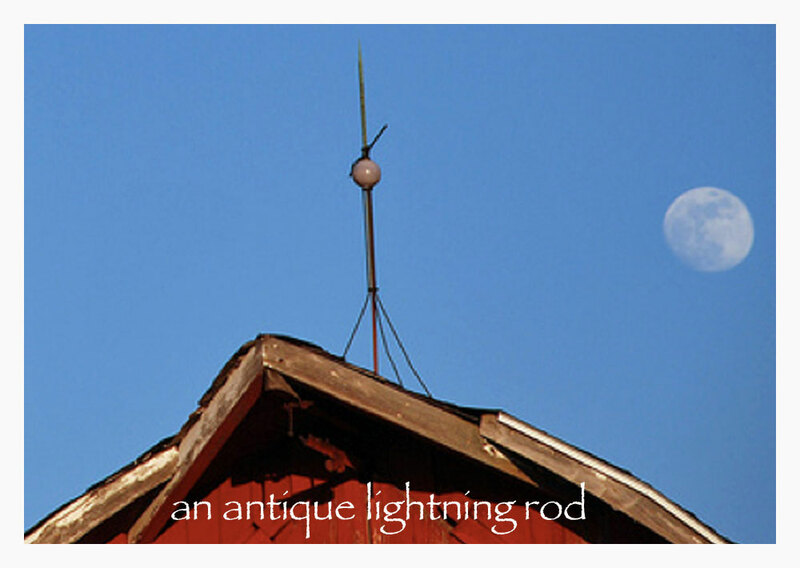 It’s just an old lightning rod. A remnant left behind, discovered and re-purposed. And then we just filled in the blanks. Made up a story. Embellished a tale to share just for the sheer fun of it. Maybe you have an Uncle Ed story that needs a few additional details—real or imagined. Or perhaps you know a rather curious “something” that begs to be retold in a humorous way. That’s where the magic is—in the imagination. In the dream of what could have happened, what might still happen . . . and the delight of bringing the fantasy to life through the weaving of your very own story.